Rich, moist, spongy yeasted pancakes with a naturally sweetened strawberry topping. This gluten-free pancake recipe is perfect to make ahead. Simply make the batter at night and enjoy pancakes first thing in the morning! In a large mixing bowl, combine the warm water and yeast. Stir together and allow mixture to sit 5 to 10 minutes. Add the melted butter and almond milk and stir to combine. Add the eggs and baking soda to the pancake batter and mix until combined. Prepare the Strawberry Topping: Add all ingredients for the strawberry topping to a medium-sized saucepan. Cover and bring mixture to a boil. Reduce heat and continue cooking, covered, until strawberries have softened, but are still al dente, about 8 to 10 minutes. 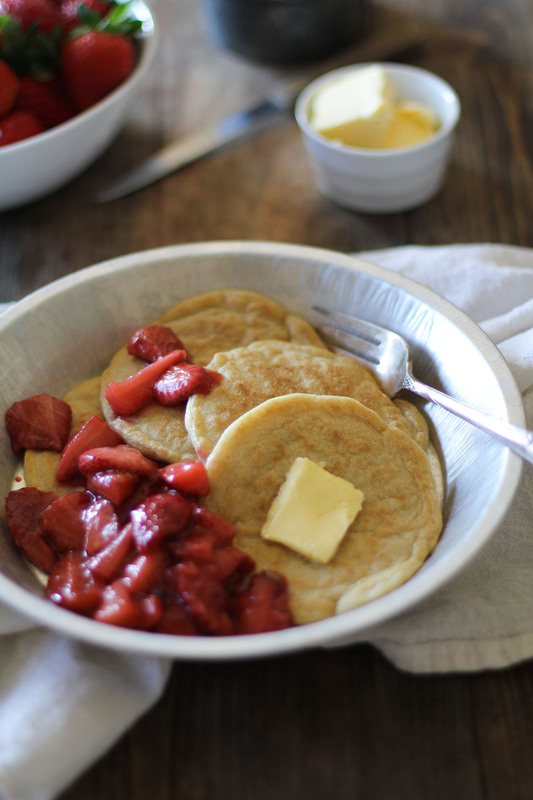 Serve pancakes with butter, strawberry topping and/or pure maple syrup.